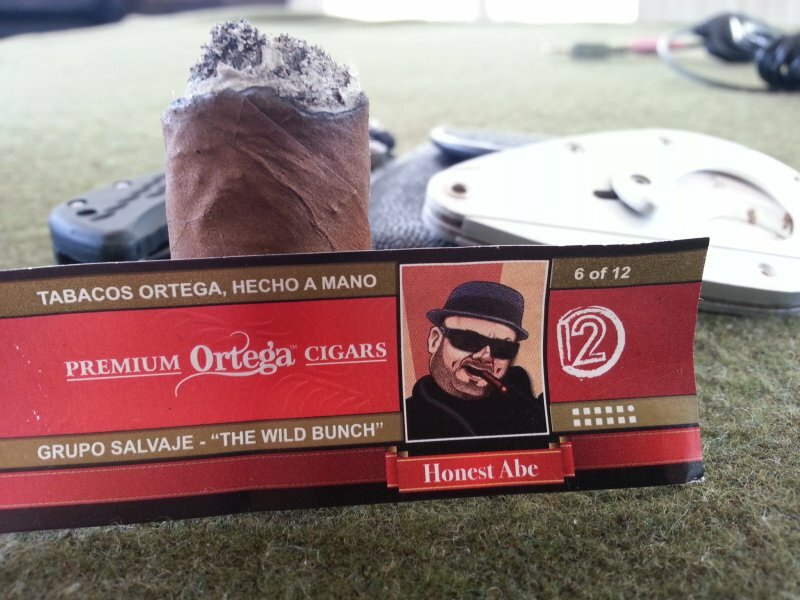 I thought I’d publish a Cigar Spotlight on Eddie Ortega’s Wild Bunch Series, and realizing how verbose I was in covering only 5 cigars for the previous spotlight, I thought it best if I did so at the halfway point. Waiting until the end of the year and posting an article covering all twelve cigars would likely be quite cumbersome to you folks reading. At year-end I plan to do the same for the remaining cigars in the series. 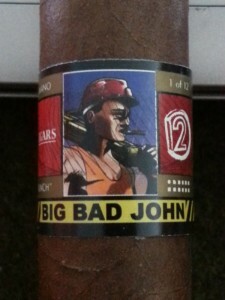 At nearly 7 inches and a 60 ring, the Big Bad John is well outside the normal size I would personally reach for. But, in the name of research I decided to give it a try. The first thing I noticed, besides its size, is how extremely oily the wrapper is. It is uniformly medium brown in color, and carries a remarkable sheen which is quite supple to the touch. Prelight, the aroma on the wrapper is faint, while that at the foot is a bit more bold – giving off an interesting sweetbread note. The cold draw is straightforward tobacco, with a bit of a hay flavor on the back end. At first light and continuing through the first inch, the initial draws are very peppery, intermingled with a bright cedar flavor. While the pepper-spice will fade as the smoke progressed, it was always present throughout the length of the Big Bad John. Progressing into the second inch and into the midpoint, a backdrop of ever-so-slightly sweet leather pushes through and complements the spice nicely. 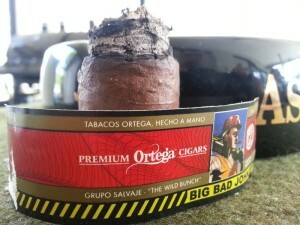 Onward toward the end of the cigar, the strength picks up a bit, although I’d still put the BBJ firmly into the medium range. I find the interplay between the leather, black pepper, and (occasional) cedar to be fascinating. Captivating, even. 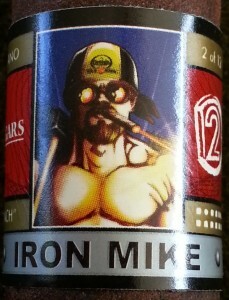 The Iron Mike “I-Beam” was February’s Wild Bunch offering. Each of the three I’ve had were well built, and have sported a deeply chocolate-colored and quite toothy wrapper. Before first light, the wrapper aroma is faint to me – giving just straightforward, tobacco goodness. The foot is slightly more bold with some haylike or mild barnyard notes as well. The draw is dark and earthy, retaining some of the hay detected at the foot. oak, perhaps, but not charred – just undried oak wood. At about the halfway point, the profile changes once again. I pick up on some fruity sweetness on occasion, braced by a foundation of earthy pepper flavors. The Iron Mike is absolutely one of the more complex of the first six Wild Bunch releases, and one I would imagine to do well if it ever were to be released into regular production (which isn’t going to happen, per Eddie O). 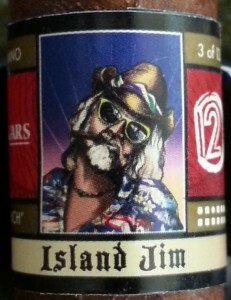 I have probably smoked more of the Island Jim than any other Wild Bunch release to date. It has struck a chord with my palate that I have enjoyed considerably, so I’ve bought a number of them since their recent release. As a general rule, I tend to enjoy Ecuadoran-wrapped Nicaraguan blends, and this is no exception. 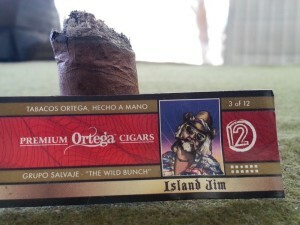 A quick look over the Island Jim shows a continuing trend with Ortega’s cigars in showing impeccable construction, providing a flawless cap and wrapper application, and neither discernible voids nor overly dense areas. Prelight, the draw is deliberate but free, and has a thick, grain-reminiscent flavor. I get a fair amount of the tangy sweetness I occasionally find in Nicaraguan tobacco, and an increasing tingle in the nose from some peppery spice that begins to build. By the final portion, this spice has picked up considerably, although never overpowering in effect. I have had near perfect burn in each Island Jim so far, with even minor retouches being few and far between. After “Tony the Boss”, this is probably my favorite of the as-yet released Wild Bunch. I first had the opportunity to try an early prerelease sample of Tony the Boss back in November, when I happened to run into Eddie at Charmed Leaf down in Delray Beach. Despite the fact that Eddie told me it was very fresh off the table, I found it to be an incredible smoke that I knew I would enjoy as frequently as possible once it hit the shelf. The sample I received from him and smoked for this review proved that theory to be well founded. 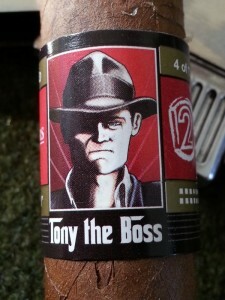 Before lighting, “The Boss” has a mild aroma at both the foot and wrapper. The wrapper is the more bold of the two, giving off a hint of cedar. Otherwise, the only noticeable aroma is that of tobacco. The draw is deliberate, but well within normal range. The cold draw does provide a bit of a sweet oat flavor, but like the aroma is very mild. I’m greeting with some spice at first light, but not overpoweringly so. This is somewhat different from my experience in November, although not markedly. I don’t remember much pepper at all at the time, although my memory is certainly subject to outright failure at times. I get some black pepper throughout the first inch of “The Boss,”with a backdrop of some sweetness – tropical spices, with just the slightest hint of brown sugar or graham cracker even. These sweet flavors develop more in the middle portion of “The Boss,” and boldly take the helm by the halfway mark. 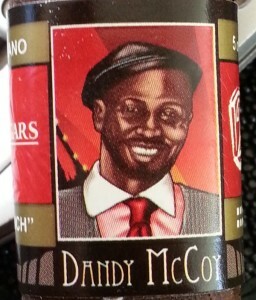 Next up is the Dandy McCoy “Empire State,” which is listed as 6″X54. I did not measure the ring, but the press on this cigar gives it a somewhat smaller profile – if it’s a 54 ring, it would have to be the longer of the two rectangular dimensions. The “short side” is clearly narrower than that. Unexpectedly, the wrapper and foot aroma are similar to the Iron Mike – although, with a bit more “pep.” It actually drew a sneeze from me when giving the foot a cursory sniff. 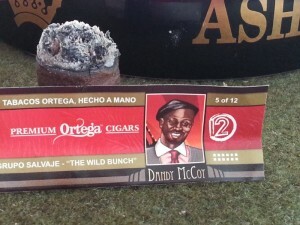 The draw on the one smoked for today was the most open of all the Wild Bunch Series I’ve tried, but still well within normal acceptable range. The prelight flavors on the draw were dark and earthy, and actually less sweet than I would have imagined beforehand. I guess I sometimes expect a bit more sweetness with both CT Broadleaf and Mexican tobaccos (although certainly not always in Mexican leaf, depending on a number of factors). It just goes to show preconceptions can be very misleading. What I do get in the first third of the Dandy McCoy is a bounty of nasal spice. The spice is neither tasted nor perceived on the palate so much as felt in the nose upon retrohale. The flavors are predominantly toasty to me, like a slightly charred marshmallow, only less sweet. I did notice the ash fell much quicker on this stick than the others, at only about 1/2″. These early flavors are unfamiliar to me, in that I typically think of toasted flavors as being dark and savory; or more “relaxed.” The toastiness in this cigar presents itself as a more frenetic, alkaline accompaniment. This is definitely one of the more unique cigars in the line to date. With the others in the series, I could think of something…somewhere….sometime that at the very least reminded me of the same experience. The Dandy McCoy is very unique in character, and not extremely similar to anything that came to mind from my smoking past. 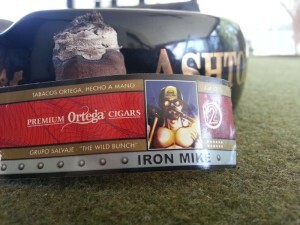 The spice subsided considerably by the midpoint of the cigar, and was replaced by a slight hint of citrus twang. Not directly citrus per se, just a hint of tartness. The strength is a bit sneaky…it never “seems” like a potent cigar, but will give you the velvet hammer treatment if you’re not carefully minding your cadence. Overall, the toasty breadiness was prevalent throughout for me. This was the theme for the entire length of the cigar, with occasional diversions into the lighter, brighter flavor families. I have only had the opportunity to smoke one example of “Empire State,” though; I think more experimentation is called for…. Along with the “Island Jim”, the “Honest Abe” is also clear concerning for whom it takes its name. 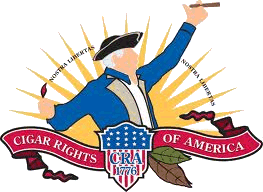 “Honest Abe” is Abe Dababneh, owner of the Smoke Inn chain of tobacconists in South Florida (“Island Jim” is Jim Robinson, owner of Leaf and Bean in the Strip, Pittsburgh, PA). I could find no information on the wrapper for this vitola, but if has a dry feel to it, is moderately veiny, and evenly colored a medium brown with just the very slightest red tint to it. The wrapper doesn’t release much in the way of aroma before lighting, although the foot is very leathery and sweet. Construction, again, is flawlessly executed in this line. The cold draw is mild in flavor, with hints of sweet hay. The initial puffs of the “Honest Abe” are at an incredible fervor. The spice on the soft palate and through the nose is intense to say the least. I’m talkin’ full-on, eye-waterin’ jalapeño style. I’m not normally an extreme pepper fiend, but decided I would stick with this cigar because the accompanying flavors were so interesting. I’m glad I did. The spice subsided within the next few minutes, which really brought the Abe into its prime. The pepper didn’t go away – it just came back to a more comfortable level for my tastes. The flavors that began to present themselves were quite entertaining – some caramel with a bit of tartness to it….almost like a butterscotch. Just an inkling of café con leche. Myriad bits of goodness. As I continued into the “Honest Abe,” I took a minute to look it over more closely in terms of construction, as I tend to do. I believe this cigar is the most expertly crafted stick of all the examples I’ve smoked from the Wild Bunch. The seams are almost indiscernible, the cap well applied, draught perfect for my preference, and the burn impeccable. Simply a glowing example of the torcedor’s craft. Nearing the halfway point, I notice that the early spice has now considerably faded. The peppery flavor is still present, but the nasal burn has all but dissipated. The earlier noted flavors are still predominant. 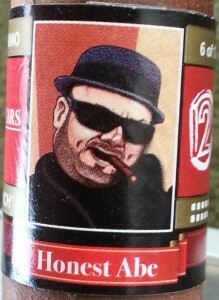 Although certainly not a dead match, this cigar reminds me of the most recent My Father Limited Edition blend. The retention of the black pepper flavor, coupled with a developing presentation of cream creates a unique and quite pleasant experience. The flavors begin to “darken” as progress is made into the final portion of the “Honest Abe.” More leathery, perhaps; almost a sweetened coffee – but less sweet than earlier noted. 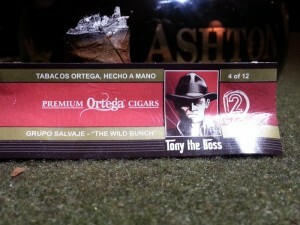 It begins to lean toward a more earthy profile, but this never really builds to a dominant characteristic of the cigar. The sweet yet spicy interplay of the flavors that I’ve found so entertaining throughout this stick continue on to the very end. Now, on the final of the first six issues of the Wild Bunch, I believe I will take back something I wrote earlier: I think the “Honest Abe” is the most “My Father-esque” cigar of the first six. This one has Garcia written all over it. Being a fan of many other My Father-produced cigars, I’m loving it. Eddie Ortega was very ambitious in taking on this project. In my eyes, he has done a superb job with the blending for each of these first six cigars – there is something in the mix for every smoker. Sweet, spicy, bold, rich, subtle, medium, full….you name it. 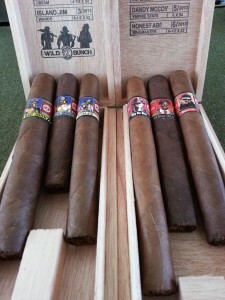 There is a cigar – or half dozen – you will enjoy. I am very much looking forward to the remaining releases in the Wild Bunch. No fewer than three of these first six will be stashed away in my humidor to experiment with as time marches on. Wow, you have been busy, sounds like you enjoyed yourself. These are going to be hard to ”pick”, O well, it’s a dirty job, but somebody has to do it! Very nice review, good job.